Home » Kids » Development » Our Family Wizard Review: Does It Really Help Co-Parents? Our Family Wizard (OFW) is a service that prides itself on being able to provide shared custody parents an effective and concise way to communicate and organize after separation. It aims to keep the child out of the middle of parental disputes to mitigate the negative effects that parental separation has on children. It has been shown that children who experience divorce can become confused, distant and lose self-confidence affecting their education and other aspects of their life. This stressful life experience can lead children astray, with children who experience a parental separation being the ones most likely to partake in risky behavior such as substance abuse, early sexualization, and crime. But when separated parents communicate to their children and to each other in a civil and respectful way, the child can avoid feeling like they’re stuck in the middle and dodge the high-stress lifestyle that disputing parents can create. So how does Our Family Wizard hold up? Does it actually help to improve the lives of co-parents and their children? Is the service user-friendly, clear and easy to understand? This Our Family Wizard Review sets out to answer those questions and more so that you can decide whether Our Family Wizard is right for you or not. Before we get started on an actual Our Family Wizard review, we want to thoroughly summarize the features and facilities that this service offers so that when one is mentioned later in this review of Our Family Wizard, you’ll know what we are referring to. You can find out more about Our Family Wizard here! To summarize, Our Family Wizard is a service aimed for families with children where the parents are undergoing separation or who have already separated. It functions to help co-parents fulfill their roles in their child’s development by offering a means of communication and planning the custody of the children in a neutral and easily accessible way. Each of these features works in conjunction with the others with the goal of providing a platform for co-parents to share important information relating to child custody. We will take a much closer look at each of these features in the Our Family Wizard review section of this article. Our Family Wizard allows multiple users to have an account on it and given certain permissions such as the ability to edit the schedule or manage file sharing. This can be useful if there is a court process and a parent would rather their lawyer arrange certain conditions of custody for them. Parent Accounts allow the parents to each have their own accounts with equal rights to all of the tools available on the service. This means that they can create and edit schedules, submit requests, upload and share files, use the message boards and create other user accounts. Third Party Accounts can be used for close friends and family members who also have an investment in the family. This can be grandparents, aunts, uncles, godparents and so on. They can view the family calendar, use their own journal and use the message boards but they do not have administrative powers. Child Accounts allow the children themselves to have access to view the schedule and exchange messages with other family members. Their accounts allow them to see just enough without them being involved in adult matters and they do not have administrative powers. Practitioner Accounts are accounts for lawyers, councilors, mediators or therapists to oversee the communications between the family. This can help them keep track of progress and work directly with the families that they are involved with. 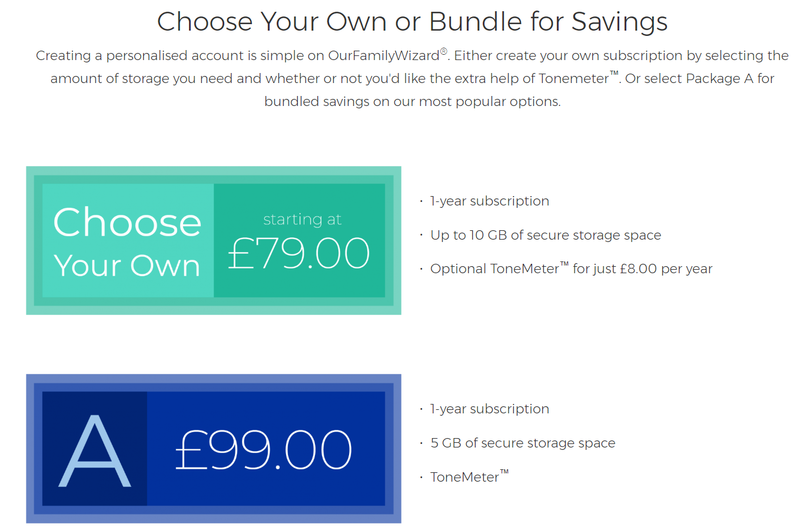 Our Family Wizard is a subscription-based service in which parent accounts are paid for but the other account types can be added for free, as and when you need them. The service is adjustable and so you can add or remove certain features such as the amount of storage space you have, to change the cost of the service. The cost of creating your own Our Family Wizard service starts at $99 per year and then this price can go up if you wish to add extra features which you think could be useful. Do the features that are on the service work well? What are the tangible benefits of using Our Family Wizard? Does it all justify the asking price? To get answers we should first start by looking at each of the features in more detail. There is without a doubt that the calendar is the cornerstone of Our Family Wizard’s service. As mentioned it allows you to create schedules and allocate tasks within that schedule which dictate who is involved and what role they’ll play. As an example: Bella (the daughter) has to go to her violin lessons every Tuesday from 6 pm to 7 pm. This event can be scheduled in the calendar for every Tuesday at these times. It can then be set that Mom takes Bella to the piano lessons at 6 pm and Dad picks her up at 7 pm every week. Maybe Mom won’t be able to take Bella one Tuesday evening because she has extra work on her plate. She can then submit a request to Dad to pick Bella up as well as drop her off on that date or request to trade this for another responsibility on the schedule at some other time. The request is then sent as a notification to the other parent through the app on their mobile phone. They can then decide whether to approve or reject the request based on their own reasoning. The whole point of this clear and concise way of communicating between parents is to take away one shirking their responsibilities all the time or to avoid miscommunications, which in some relationships happen frequently. With this centralized place where all of the information can be stored, there’s no “oh I forgot”, “I must have written it down incorrectly” or “I didn’t know it was today!” because the same event is there for both parents to access. The message board feature is basically an email inbox. The benefit of having one here? It allows you to communicate with other users, especially your ex, without having to sift through other emails and spam. Not only that, but the messages are secure and can’t be deleted which means they can easily be used as evidence in court should anybody display unacceptable behaviors. There is also an optional feature called the tone meter which can come at an extra cost depending on your subscription option. If you or your partner has the tone meter turned on, it will notify you when writing a message if you are coming across as somewhat aggressive or degrading. The tone meter isn’t the best feature and it does sound a little bit condescending but it does serve to make you think twice about how you are communicating with somebody else. If you types “You’re an idiot” for an example, the tone meter will display in red and you can then expand it for it to explain that the wording you are using is attempting to humiliate. It’s a good way to gauge how it will look in court if a parent was to behave in a derogatory or aggressive manner. But on the other hand, it does take wording that’s not in the slightest bit malicious and calls it “upsetting” sometimes. Tone meter can make you think twice about the wording you are using. The expense log is our favorite Our Family Wizard feature by far! 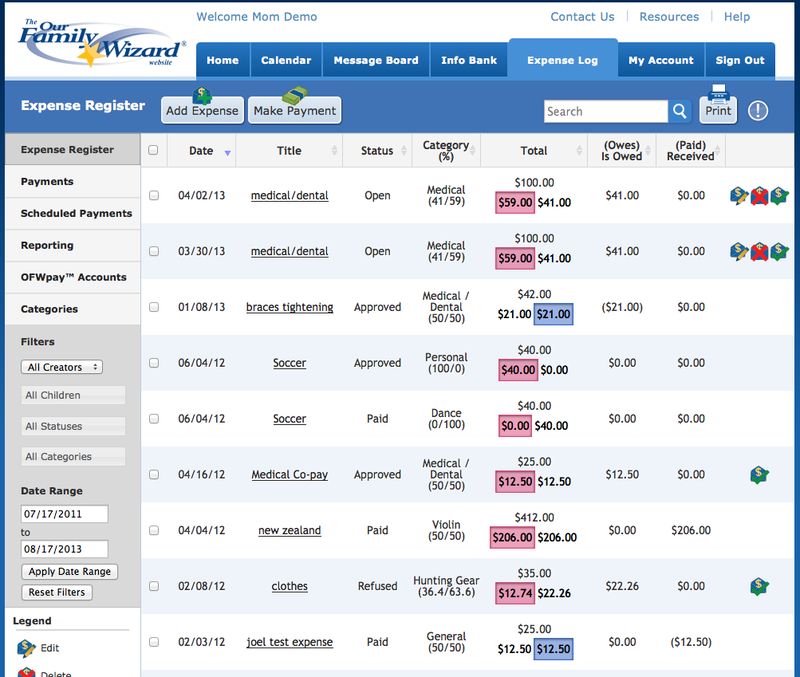 It’s so useful and convenient to track and share expenses and keep all of the info in one place where it can’t be lost. Compare that to writing these things down on paper or a spreadsheet, they just require much more effort to keep it organized. Your records of expenses and expense requests can be kept on record clearly and accurately which can be used in court if it’s called for. Otherwise, it’s a fair way for co-parents to share the expenses related to child custody and caring for the child. Let’s say hypothetically that Bellas piano lessons are $500 for the year and Mom has paid this upfront but it’s the responsibility for both parents to split the costs 50/50. Mom would list the piano lessons in the expense tracker as totaling at $500 and make a request for Dad to pay the difference. Dad can either then accept or reject this request and will receive it as a notification on his phone via the app. Once Dad has approved the expense he can then pay securely through OFWpay, which has no set up fees to receive funds, and Mom will receive the reimbursement in between 5 and 7 days. You can even upload photographs of receipts that you have indeed paid for the expense upfront and attach those photos right on the expense in the expense tracker. 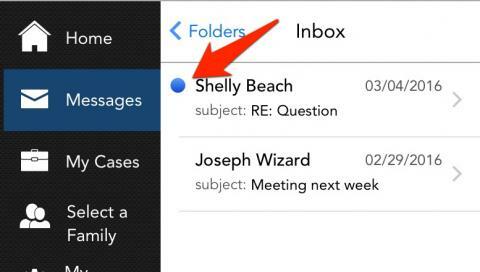 This feature takes away the tedious and monotonous manual expense tracking on a spreadsheet or on paper. And it does away with arguing over who has paid what and whether or not one parent has reimbursed the other. What makes it better is that it’s all logged accurately and precisely and it can be printed out whenever it’s needed. If one parent simply just refuses to pay what they are required to, it can be argued in court and the evidence is there for the judge to see. The journal is a simple feature which allows any user account to write down whatever they want. They can make their journal private or public and use it to express themselves (as many councilors and therapists will recommend doing), keep track of their experience or keep a log of any occurrences during the separation. It certainly has its uses but it’s more of a throwaway feature as many can just as easily use their own physical journal or some other computer program to achieve the same results. With that being said, it does help to have it all in one place with the rest of the stuff relating to the co-parenting situation. The file storage facility is really quite a simple feature too, it allows you to upload documents, videos, photos and other media so that it can be shared between the users. It may not seem that it would be particularly useful as this same data storage and sharing can be achieved with other services. But it does grant you the benefit of having all of your information relating to your child custody and co-parenting all in one place. It’s just an added way of keeping your life organized by keeping your family related stuff in one place away from everything else in your life. That way you’ll know where to find it all without having to sift through other stuff and without the risk of it getting lost. It’s also a way of sharing and storing memories with other family members and storing important information such as prescriptions, receipts, school reports, letters and all sorts of other information that can easily get lost amongst other unrelated stuff. The only other thing to note about this feature is that it is highly dependant on the amount of storage space you have signed up for. 1GB is not at all that much and won’t facilitate the storage of many videos. You may wish to upgrade to 5GB or 10GB to get a more realistic amount of storage for media like that if that’s your intended use. The app that comes with Our Family Wizard can be found on both the Apple App Store and the Google Play Store and is compatible with the associated platforms: Android and Apple. It basically gives you access to the same toolset that the browser-based service does but is shrunken down to fit on your phone. They have done a great job at adjusting the service to the mobile, as it’s laid out extremely well and is so easy to use! It also employs the use of push notifications so that all those associated with a certain change on the system is notified via their phone. For example, if a change to the schedule was made, or a new event was added, this would notify all involved parties on their mobiles. Similarly, if a request was made, the recipient of the request would get a push notification and can deal with the request wherever they are. It’s a great way to keep everyone in the know! This adds so much value to an already well made product as it gives Our Family Wizard the ability to achieve a better service across the board. The only downside that can be seen is that the schedule is quite difficult to manage using the mobile. This is more down to the nature of the mobile phone having a small screen, too small to fit the schedule on for editing, unlike a desktop where you can see the whole thing. As you can see there are many features that OFW has and they do work well together. Some features such as the journal and the file storage do not seem like they are needed on the service but they have added extras that pull the service together as one working unit. All of the OFW features work in conjunction with each other to bring you a service where all of your family organization, planning, finances, and interactions can be brought to one place. This is convenient, safe and handy, particularly for a separating couple who are undergoing court proceedings. 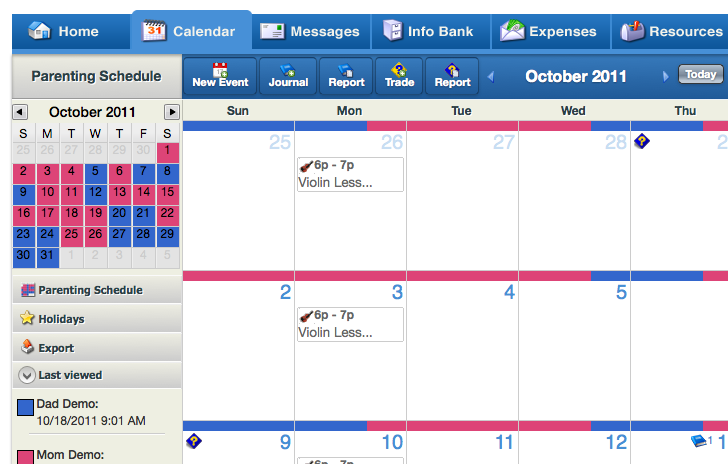 Everything is laid out clearly and because of this it is just easy to create, edit and share schedules and expenses. It opens up communications between couples who may not be in the best place at this point in their lives, and if things are not even civil, at least communications can be saved and printed out which can then be used by lawyers, courts, councilors and therapists. Our Family Wizard brings a family who is being torn apart closer together. It helps to keep the children involved out of the disputes between parents as this can all be kept between those who need to be involved. Without them witnessing the tension and frustration between their parents who are dealing with stressful matters revolving around custody and money, they won’t suffer the consequences of that. That is the main reason disputing couples should use OFW, at least if it’s just to keep their private affairs, private! It’s a small bit overwhelming when you first start using the service, but most new things are. There are plenty of tutorials that can teach you how to use it if you get stuck, but honestly, it’s presented in such a simplistic way you shouldn’t need to worry about that. It’s not as sleek as it could be, but it is practical and it does the job you need it to do. Some features feel like they don’t belong and the tone meter does feel a bit condescending, however, for some, it may make them stop and think about how they are speaking to another. Some might say that the features of my family wizard can be found on other services, for much less of a price or even for free but that’s somewhat misleading. The services they refer to are not focused on family matters and do not facilitate specifically for them. Things can very easily get muddled and disorganized also if you are switching between different services for your file storage, calendar, expenses and so on. OFW aims to bring all of these services together into one platform and this is something that couples can utilize well. To conclude the Our Family Wizard review we’re going to ask the final question on our agenda: is it worth the asking price? The answer to this question depends on the subscription you choose, but let’s keep the 1st bundle option in mind which is: 1-year subscription, 10GB storage, and the tone meter – $119.97 per year. To break it down even more, $119.97 per year amounts to just $9.99 per month. This is a pittance when this amount of money can easily be spent on consumables such as coffee, nicotine products, food, etc. And consider that divorcing couples will often use their lawyers as a means of communication when disputing family matters with each other. Lawyers charge high hourly rates! You could be spending $30 on less than an hours work from your lawyer that you can get 3 months worth with OFW. So you are actually getting a lot of value from such a simple solution for the money that you pay. It’s certainly worth checking out just for the saving but then you’ll find that you’ll be able to better organize and plan your family, even going beyond the parental separation.